The number of people paying for music subscription services in the US market is starting to flatline, according to new figures – even though the revenue they are generating continues to jump. 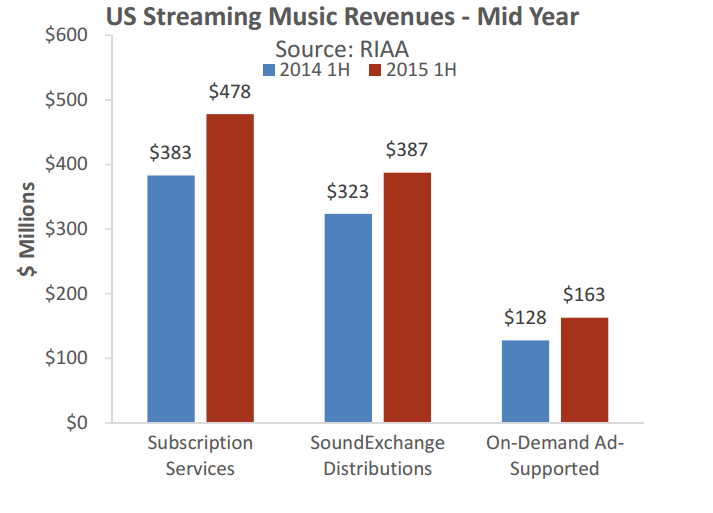 According to RIAA midyear data, the US market saw 8.1m people paying a monthly subscription to a premium streaming music service in the first half of 2015. That was up by a worryingly small 2.5% – or 200,000 – from the 7.9m people who shelled out for a premium account in the same period of 2014. In prior years, streaming subscription numbers have leapt up by much more significant degrees. From H1 2013 (5.5m) to H1 2014 (7.9m), for instance, the average monthly number of streaming subscribers grew by 43.6%. However, these figures do not include the extent of the launch of Apple Music, which arrived on June 30. According to the New York Post, 15m people have signed up for Apple Music’s free trial worldwide, with around half (7.5m) expected to continue to pay for the service. Also, the US paid-for streaming market looks a like healthier by value: the 8.1m people who subscribed in the first half of this year spent $477.9m on streaming services. 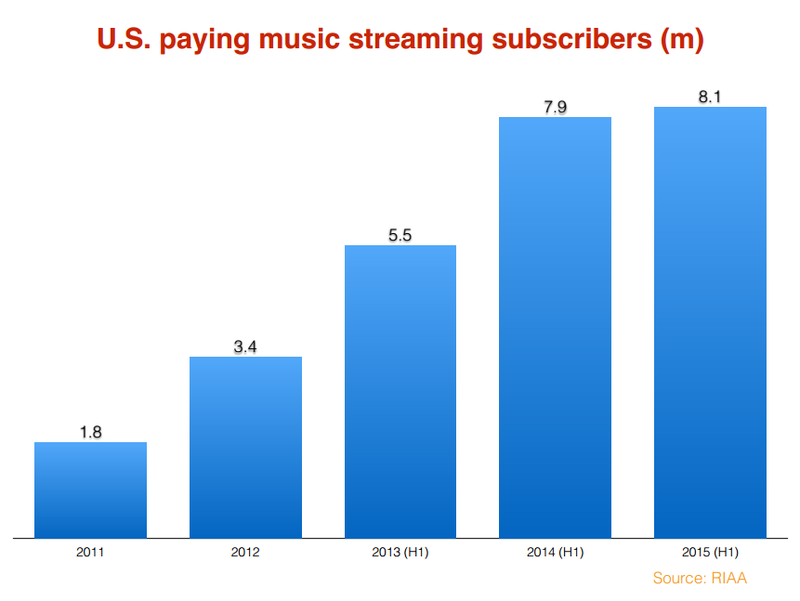 That was up 25% on the $382.7m generated by streaming subscriptions in the same period of 2014. In other words, the average annual revenue per user (ARPU) of those paying for streaming subscriptions in 2015 is $118. At the same stage of 2014, according to MBW calculations, that ARPU number would have stood at $96.96. Analyst Mark Mulligan tells MBW that “the main factor here is AT&T closing down Muve in Q1 resulting in 2.5m subs disappearing overnight with most not shifting over to Deezer”. Another less significant factor could be people switching to more expensive services, with the obvious candidate being TIDAL, at $20-per-month. The debate will now rage over why the growth of paid-for subscription is slowing down to such a worrying degree. Fingers will of course be pointed at freemium music tiers. The RIAA’s midyear numbers, which include YouTube, VEVO and free Spotify, show that revenue raised by these and other ad-supported services grew 27.1% year-on-year in H1 2015 to $162.7m. Meanwhile, midyear SoundExchange collections – which come from digital ‘radio’ services such as Pandora and Sirius XM – grew by 19.7% to $387.2m. 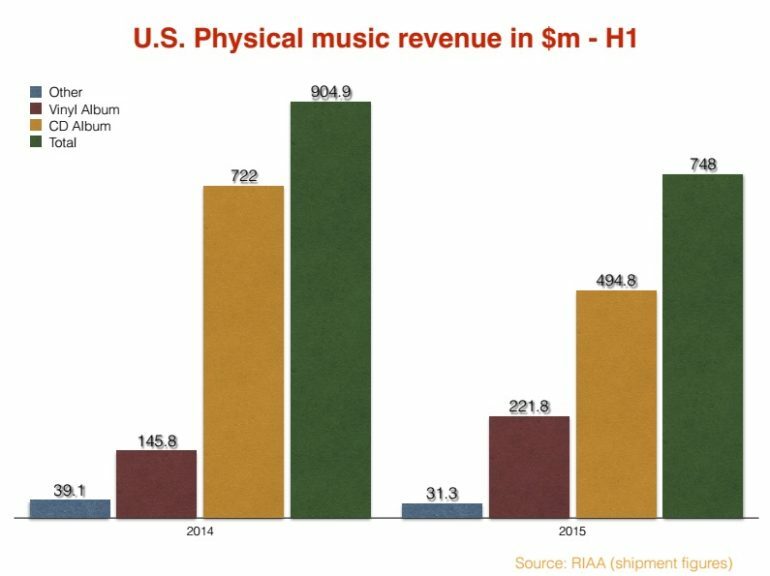 Thanks to these gains, overall digital recorded music income in the first half of 2015 in the US stood at $2.323bn, up 6.3% on H1 2014. Total streaming income reached $1.03bn, claiming around a third of the overall recorded music market. As covered through here, the overall US market value fell by 0.5% at retail in H1 2015, down from $3.182bn to $3.166bn. The total value of digitally distributed music formats (downloads and streaming) was $2.3 billion – up 6% compared to the 1H of 2014. However, revenue from permanent digital downloads (including albums, single tracks, videos, and kiosk sales) declined 4% to $1.3bn. Digital track sales declined by value 9% to $688 million, with sales volume down 12% to 570 million units. 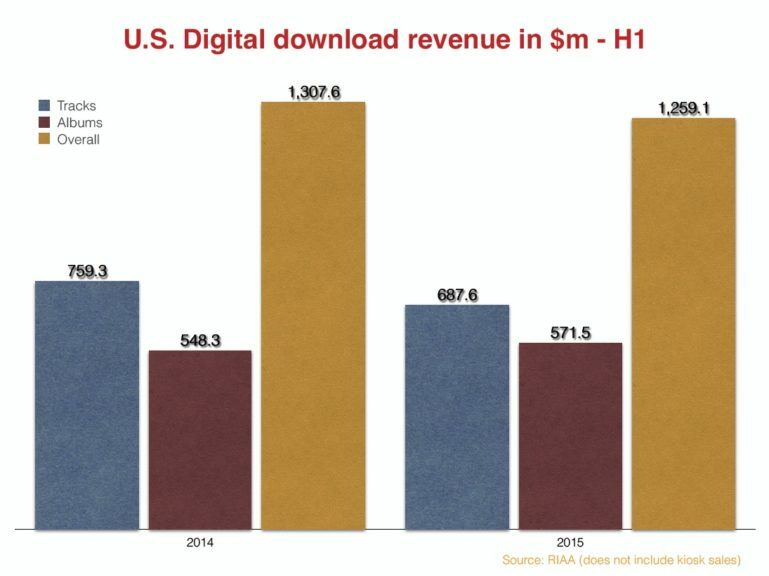 Income from digital albums grew 4% to $572 million, while digital album unit sales were up 5% to 57.5 million. Digital accounted for 76% of the overall market by value, compared with 71% for 1H 2014 (sync excluded). Total value of shipments in physical formats was $748 million, down 17% versus 1H 2014. CDs made up 66% of total physical shipments by value. Vinyl was up 52% by value for the first half of the year, and accounted for 30% of physical shipments by value. Synchronization royalties stood at $95 million for the first half of the year, up 4% versus 1H 2014.